In a sense, education is easy. Buy a box of books and have your kids go through them. Train them the recipes of math and they’ll get the same outcome every time, as with a calculator. Give them a list of dates and templates for five-paragraph essays. We could call that education, in a sense. But by that measure, education is not our aim. Enculturation is our aim, and while education is easy, enculturation is hard. We commend the works of the Lord to another generation, with the tools of classical education, weaponized laughter, and sacrificial labors so that they will carry and advance Christ-honoring culture. We are trying to equip the next generation of culture carriers. And we employ a host of tools in order to make that happen. With the next few minutes I wanted to speak a bit about each of these tools. 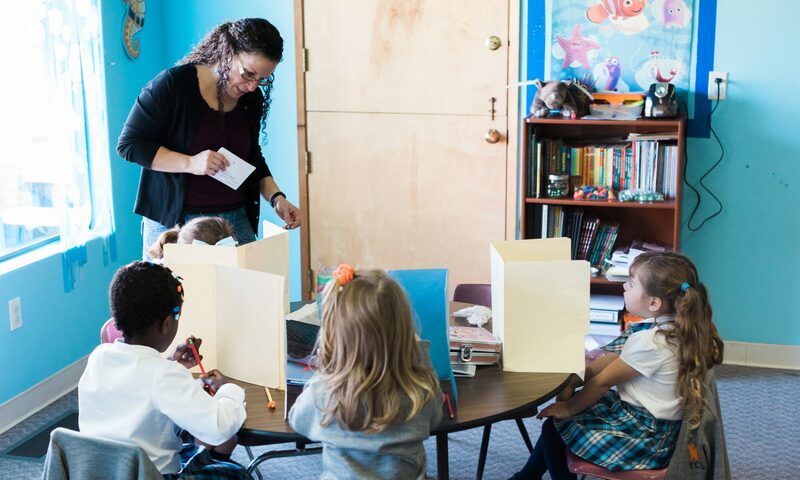 Our version of classical education utilizes the curriculum of the Trivium (Grammar, Dialectic and Rhetoric), teaching all of the subjects as an integrated whole with the Scriptures at the center. Grammar, Logic and Rhetoric don’t just represent increasing levels of familiarity with a subject like Math or History; Grammar, Logic and Rhetoric are subjects by themselves. Most of our formal grammar relates to the basic building blocks of languages. We teach our middle school students Logic, and – then building on the Grammar and the Logic – we teach our high schoolers to express themselves winsomely and persuasively in Rhetoric. Additionally, classical education involves classical language study. Some classical schools offer Greek, but we offer Latin two days per week in grades 3-10. Latin grammar requires precision of thought and it provides a fantastic foundation for English mastery, given how much of English is derived from Latin. Last, for now, classical education involves the study of classical literature. In order to understand how we got where we are religiously, ideologically, politically, socially, and more, we study many of the books that have been the vehicles of important ideas for the course of the last 4,000 years of our history. This also offers us opportunities to wrestle with hard concepts and puts oil in the students’ apologetic engines. We read the Bible, we read Augustine, Calvin, Aquinas, Luther, Lewis, Piper, Packer and Sproul. But we also read Homer, Plato, Aristotle, Machiavelli, Nietzsche, Camus, Hemingway, Orwell and Hitler. We have entire units on the Constitution, the Hippocratic Oath, the Nicene and Apostle’s Creeds. So in this business of commending the works of the Lord to another generation, we employ classical education because we believe it best equips students practically to be culture carriers. Our school’s motto is “Laughter is War.” We try to wield the weapon of laughter for a number of reasons. I’ll suggest a few. We laugh because it keeps us from taking ourselves too seriously. When you’re reading Cicero and studying Latin, there’s a temptation to become a snob. When you’re aware of your privileged position as a 21st century Christian, there’s a temptation to be judgmental in your study of prior generations. Laughing with gratitude helps to orient us. We laugh because our God has given us wild blessings and riches in Christ, and we are happy in Him. We laugh in order to make the world jealous. We’re working to promote in them the right kind of jealousy; we want for them to want what we have, because God would lavish His grace on those who trust in Him. And our happy laughter ought to be enticing to the world. This is contrasted with stuffy, dour, serious Christianity. We are serious as a heart attack when we laugh with confidence. We laugh in victory to taunt an already-vanquished enemy. And this sort of laughter actually produces a grateful humility rather than pride. We laugh because God is sovereign, He is good, and He is for us. The outcome of the story is written, and we are on the winning side. We laugh not because our heads are buried in the sand, but because our heads are up, our eyes are open, and we are able to look about us and see evidences of God’s grace and control everywhere. We laugh because we can be confident that in this world of raging unbelief, cancer, abortions, murders, suicide, wars and lies, God has a good plan for all the evils of the world, and He will bring about good in the end. So we want to wield our laughter for the weapon it is. We employ weaponized laughter because we believe it best equips the students to be faithful in their cultural advancement. Last, we employ the tool of sacrificial labors. The gospel is counterintuitive. For as long as men have been around, they’ve been trying to figure out a way to appease the spiritual forces, and all their most valiant efforts fail. But the just God became the justifier of men, took on flesh to make payment to Himself. The Son offered His Son in love for us. That’s not something we would expect from Zeus. And this is the gospel. The gospel teaches us that sacrificial love is effectual. It will have its effect in God’s perfect timing. The more I love my wife sacrificially, the lovelier she becomes. And as a school, the more sacrificial deaths we die for our families, the more life we should expect to come of it. Death brings life, in churches, in homes, in schools and everywhere else. We talk about this as a staff, but as we die to our own conveniences and schedules for sake of the families we serve, God blesses and brings forth fruit. It doesn’t have to make human sense to be true, but we do want for our students to leave these walls believing this principle to the marrow of their bones. Their love for their families and their neighbors can (and we expect will) be transformational. So we employ the tool of sacrificial labors to best equip our students to stay the course, to be faithful even when it violates our natural reason to do so. Along the way, in all of this, students learn how to write in cursive, multiply by fives, rattle off an Encomium and ask for forgiveness. All good things, and all necessary things if we would transform this community that we love.